So you have water in your basement? | GPR, Inc. So you have water in your basement? Many people have water in their basement and in many cases; it is very easy to stop. You don’t need to be an expert to fix many problems and all you need is some basic supplies from the hardware store. What Are the Causes and corrections? 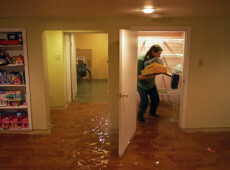 A high groundwater condition often results in water in the basement. At times it is exhibited by dampness or seeping water in cracks in the concrete floor or along the basement walls. Water actually spurting out of a crack is a sign of hydrostatic pressure. The groundwater is exerting pressure on the concrete and forcing the water through the crack. The causes and corrections of this type of wet basement are several and difficult. Older homes were often constructed without crushed stone or granular material under the basement floors and without drainage system around the footings. If the basement sits in the groundwater there is nothing to prevent the groundwater from forcing its way into the basement. Correction measures for this type of wet basement involve “French drains’ and similar disruptive construction techniques and are typically not DIY projects. If you have these problems consult a reputable contractor who specializes in this type of work. If you get water in your basement and it is the result of a backup of a sewer line you should know whether you have an onsite septic system or you are connected to a municipal sewage system. Either way, the first thing to do is to have the building sewer (the pipe that connects your plumbing to either the septic tank or to the municipal system in the street) cleaned by a professional. 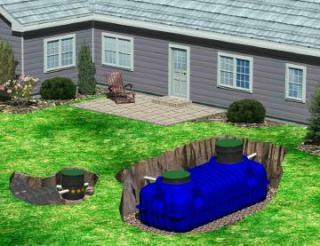 If you have septic system, the next step is to inspect the system for failure. In Massachusetts, the Commonwealth licenses septic system “Inspector” and you should have a “Title 5” inspection performed by a licensed professional. In Massachusetts, contact the Department of Environmental Protection for a list of inspectors. If you are connected to the municipal sewage system and the building sewer is clear, the next step is to contact the municipal sewer department. There may be a serious problem with the sewer main in the street. Most common are problems associated with leaking gutters, gutters that are too small to handle all the water the roof collects and downspouts that discharge the water too close to the basement wall. There is an old “rule of thumb” that a roof should have one downspout for every 20’ of gutter. However, roofs are different and the gutter and downspouts should be sized according to one of the many free calculators. Often, homeowners have their gutters replaced and the contractor simple puts a new 4” gutter along the eaves and attaches a 3” by 3” rectangular downspout or two without regard to the amount of roof being collected. If you hire a contractor to replace the gutter ask him to give you the sizing calculations. Gutters that are too small for the roof area or those that are filled with leaves or other debris will overtop. The overtopping water will splash right next to the basement wall. This water will work its way down into the ground following the wall and undoubtedly find a crack and create a puddle or dampness in the basement. Properly sized and cleaned gutters are essential to preventing and curing wet basement problems. Often the ground around foundation walls settles either due to incomplete compaction during construction or due to standing water. As noted above, water that collects in depressions along the basement walls quickly finds its way into the basement or creates dampness on the basement wall. Depressed areas should be filled and the area should be graded to make sure the water flows away from the house. If the crack does not spurt water as described above, the crack can be undercut and filled with hydraulic cement. Undercutting involves enlarging the crack with a chisel and angling the cut into the concrete away from the face of the concrete. This allows the patch material to bond with the concrete. The undercut crack should be moistened with water prior to being patched. The hydraulic cement should be pushed into the crack completely filling the crack. This technique works equally well for floors or walls. There are many brands of cement patches, read and follow the manufacturer’s directions. Groundwater and Hydrostatic Pressure – As noted above, this is a professional job that can cost several thousands of dollars and should be specifically designed for each site. Sewer Backups – Sewer cleaning is relatively inexpensive, but again should be done by a professional. Surface Water – the corrections described above are all DIY projects that can cost nothing for simple regarding to less than $20 for hydraulic cement to several hundred for replacement gutters and downspouts. A handy DIY person can install new gutters and downspouts and save a considerable amount of money. But, remember to size the gutter and downspout properly. The following link is a helpful internet tool for this: http://northclad.com/gutter-sizing-calculator/. Use the 100-Year Storm Rainfall and that will insure the gutter should handle even the heavy rainfall associated with a summer thunderstorm. If you want a professional review of your wet basement, please feel free to contact me at: dmiller@gpr-inc.com.